My goodness, is it 2019 already? This past year was crazy for me. I can hardly believe it’s over. So many things happened all at once, and there was hardly time to catch my breath (let alone keep up with this blog). I published a book, traveled all over the country, was part of multiple theater productions, and did all kinds of fascinating costume design projects. At long last last, I’m finally starting my new blog series on costumes design! Every since I wrote my post about the “Portfolio Life” last March, I’ve been wanting to branch out and cover some of my other artistic endeavors (besides writing). But I was too swamped last year. Today marks the first of multiple posts in which I’ll be writing about the costumes I designed this past summer for a fantastic local theater production of Beauty and the Beast. First up: Belle’s 18th century peasant dress. When I volunteered to make these costumes, I knew I would NOT be patterning them after the original, animated film. In my opinion, trying to make live actors look like cartoon characters is both difficult and pointless. It always comes off looking unoriginal and a bit overdone. I’d much rather enjoy the special opportunity that live theater brings. It’s a medium where every show, actor, and costume can add something fresh and creative to the familiar story. My first step was to look around for inspiration, and I found it in Jacqueline Durran’s fantastic costumes in the new live action movie (made in 2017). I LOVED those costumes! Lush, spectacular, and amazingly detailed, they did a fantastic job capturing the time period. I knew I wanted our theater production to have the same textured, historical flavor. The first costume I started on was Belle’s blue dress. I love how Jacqueline Durran’s left behind the historically-inaccurate, blue A-line dress and white apron of Disney’s original, and instead took the same color scheme and created a much more historical, textured look. However, I still didn’t want to just copy someone else’s idea. This was not cosplay, it was theater. So I pulled out my colored pencils and sketched out my own concept for an 18th century French peasant girl. Since I grew up doing colonial reenactments, I already have a lot of experience with making and wearing period accurate clothing from the 1700’s. However, theater costumes need to be much simpler to take on and off than period correct clothing is. The outfit I sketched, for instance, if constructed “correctly” would be at least 4 pieces. The white blouse/nightgown (called a “shift” or “chemise”) would be a bottom layer, followed by an underskirt then the blue over-skirt, and finally the laced bodice. But that kind of thing would never work for quick costume changes. So I had to brainstorm. I remembered seeing a “costume” version of 1700’s clothing years ago, carried in the fantastic Townsend’s catalog (which is an amazing resource for re-enactors). Basically a one-piece shift/skirt combo, with just a separate laced bodice. But the look was not quite what I wanted. For simplicity, they had made the skirt only as wide as the shift. And it just looked wrong to me. I wanted more fullness. Finally it occurred to me that I could make just the “top half” of a shift, then stitch on a fully-gathered underskirt/skirt, and pull it in with an elastic waistband. But the first step was finding fabric! We had a modest costume budget, considering the elaborate nature of this kind of production ($500). So there was no way I was getting all the fabric new. But it’s amazing what fun and beautiful fabric you can find at thrift stores in the form of sheets, curtains, and table-clothes! For the shift and petticoat (underskirt) I found some white curtains edged with pretty eyelet lace ($2). The main skirt was made out of a patterned bed-sheet, which came with a lovely printed boarder ($4). For the bodice, I found some nice , textured blue garment fabric in the back room of a thrift store, already cut out into a dress but never sewn together ($1). 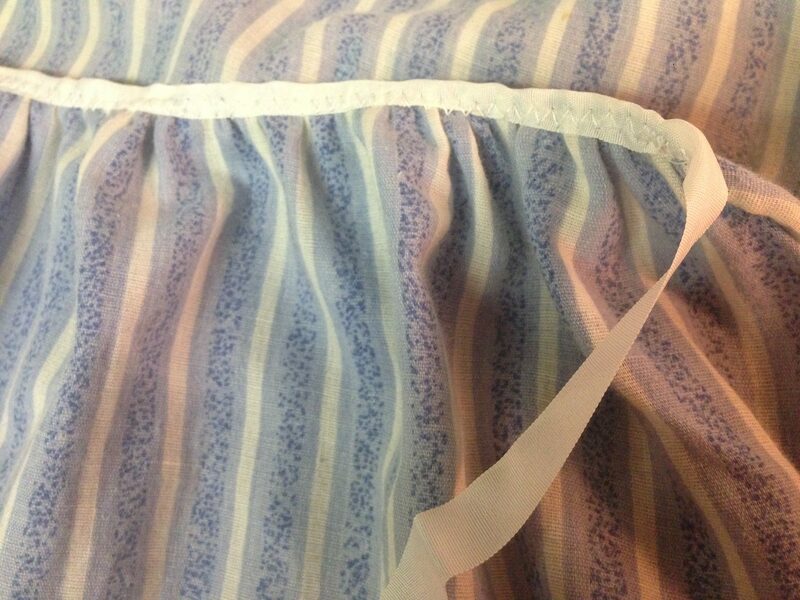 And finally, I used a blue&white striped pillowcase ($0.99) to make a quick apron. All the pattern pieces were just simple squares and rectangles. So easy! First step was the shift, which I made using a very simple pattern from this book. All the pieces are cut in easy squares and rectangles. (The full-length version had some triangles as well, but I was only doing the top half). Since the pattern in the book was marked out in inches, I was able to measure and cut all the pieces using my quilting mat, ruler, and cutter. No tracing required! I intentionally cut the sleeve at the curtain’s edge, using the already attached lace so there was no need to worry about adding a casing and ruffle. I simply wove some white elastic cording through the eyelets at the top of the lace, and BOOM! Instant sleeve ruffle. Everything went together fast until it came to finishing the neckline. In period clothing, the neck would be gathered with cotton cording or ribbon. But I wanted to use elastic cording for the sake of quick costume changes. The problem came in when I was trying to figure out how to attach it (along with a lace ruffle). First I tried making a bias-cut casing, but it ended up looking bulky and awkward. Then I tried surging the raw edge and simply folding it over around the elastic to make a self-casing. But that didn’t work either. It puckered badly on the curve of the neckline, and ended up so tight that the elastic would hardly move. FINALLY it occurred to me that I could use the top of edge of the same lace that I used for the sleeve. I cut about an inch off the top, did a tiny rolled hem on it, and sewed it onto the serge-stitched neckline. Then I ran the elastic cording through the eyelets just like I did for the sleeves. Voila! The half-shift was complete. Next came the underskirt. Since I had multiple panels of the lace-edged curtains, I decided to do a lace-edged petticoat that peeped out at the bottom. To make sure I got plenty of gathers and fullness, I used quite a bit of fabric. No hemming was required, as I just used the edge of the curtain that was already finished withe lace. I gathered the top edge down small enough to fit the raw edge of the shift, and sewed the two together. This gave me a rather odd, billowing white garment with a very wide, low waist. Next step was the blue over-skirt. I loved the wide strip of contrasting fabric along the top edge of the sheet, and thought it would make a great hemline. But there was one problem. I wanted the skirt very full, which meant I needed a hem TWICE the length of the twin sheet’s top edge. I thought about just cutting the strip off all together, but I so loved that fun contrast! So I ended up removing the double-sided strip, cutting it in half length-wise, backing it with more of the main sheet fabric to give it weight, re-attaching it to the skirt edge, and re-hemming. It was a lot of steps, but worth it. For the the waist, I created a casing and ran elastic through the top of the skirt, tightening it up just enough to match the width of the shift and sewing it on like the petticoat (but higher up). Then I tightened the elastic the rest of the way to create a normal waist. But…it didn’t work right. In the first place, the bulky, narrow waistband was not going to lay smoothly under the bodice, and in the second place, I realized the skirt needed to start a bit higher up (above the natural waistline) overlap underneath the bodice and not leave a white gap between them. Thankfully, I was able to solve both problems at once by loosening the elastic again, folding the edge of the shift down to cover the casing, and stitching it in place. This hid the waistband and acted as a deep tuck in the shift, raising the waist up an inch or two. Once I re-tightened the elastic, the main dress was finished! 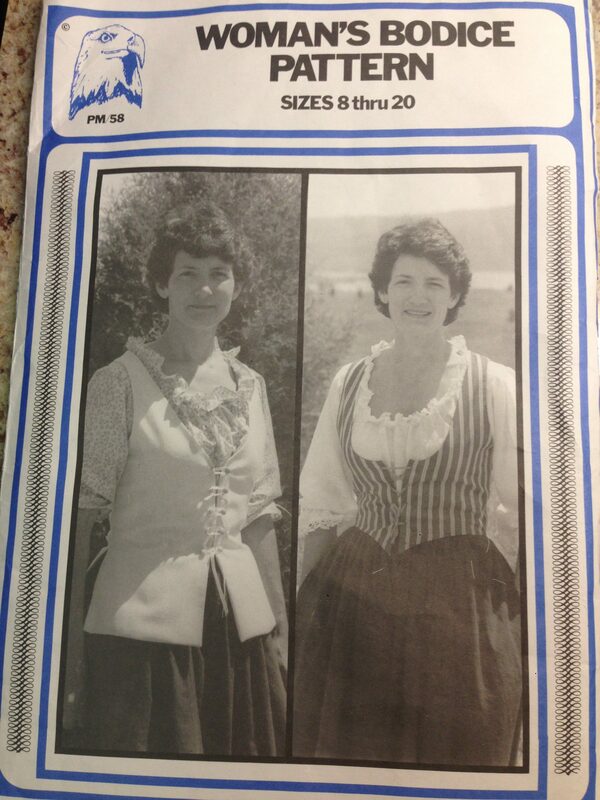 For the separate bodice, I used this historical pattern purchased years ago from Townsends. I opted for the French version (naturally, since the story is set in France), and made both the exterior and lining out of the blue dress fabric. It was nice and thick, which gave the bodice the stiffness it needed to lie smooth. This bodice pattern went together extremely fast. The only complicated part was finishing the front. I always like to use boning in laced bodices, to help the edges lay smooth instead of pulling and puckering when you tighten the laces. I never buy actual boning though. Somebody pointed out to me years ago that I could I just use cheap plastic zip cords from the hardware store. (I’ve saved a lot of money with that trick!) To make a casing, I sewed a deep seam when I stitched the lining and outside fabric together there, then ran another seam closer to the edge of the fabric. This built a casing into the seam itself. Before hemming the bottom edge, I slid a zip-cord into each casing and cut them off short enough to fit, making sure to trim the ends into curves so there would be no sharp corners to rub holes in the fabric. Last came the eyelets for the laces. I’ve never bothered with store-bought metal eyelets. They aren’t historically accurate, so I grew up hand-stitching every eyelet on every bodice I made for re-enacting. BUT… as I started mentally counting up how many eyelets I would need for all these costumes, I knew doing it by-hand wouldn’t work. Thankfully, I discovered it is quite possible to make eyelets using a home sewing machine. (There are multiple tutorial videos like this one on youtube.) I had to practice for a bit before I got confident enough to work on the actual bodice but it was so worth it! These eyelets still weren’t perfect. But I got much better as I went along. Though my original drawing didn’t feature an apron, I ended up making one out of the blue-striped pillowcase I found. It was faded and a little yellowed, but after-all, a peasant girl’s apron is not going to look spotless and new! I cut off the wide hem around the pillowcase opening, but instead of ripping the side-seam and opening it up completely, I just made the apron the same width as the pillowcase, leaving it two layers thick for weight. The raw bottom edge I finished with my serger, then folded over and hemmed with a zigzag stitch. The top edge I gathered and pinned inside a long strip of hem tap that I folded in half and stitched down to create the waistband and ties. The whole thing probably took less than 30 minutes to make. The last step involved shoes (pun intended). My original drawing I had Belle wearing blue ballet flats like the animated film. But as it turned out, I had the perfect pair of period-correct, leather shoes left over from re-enacting days. They ended up being just the right size, and were a nice neutral beige color (which meant she could wear them with both of her costumes). The only problem was that they were never actually finished, and didn’t have the buckles they were supposed to. So I ended Jerry-rigging them with a lot of electrical tape and come small, rectangular buckles we had on hand. (I had to tape two together and cover up the tongue in each buckle since the leather had no holes to poke them through). I also used tape on the inside of the shoe to hold it closed, since the buckles didn’t actually do anything and were only decorative. They ended up looking really good on-stage! I was so glad I took all the extra time to do the contrasting boarder at the hemline. I love how the bottom of the dress is so layered, with the mixture of different blue fabrics in the skirt, and the lace petticoat peeping out underneath. I LOVE that contrasting boarder! I used white ribbon to lace the bodice (and tied knots in the ends to keep it from pulling out during costume changes). I had originally planned to use more elastic cording (and I did later for the Silly Girls and Babette), but there was so much thick fabric around Belle’s waist that she needed the ribbon to pull it in firmly. Elastic stretched too easily. Mandy’s measurements are bigger than the actress who played Belle, so the bodice doesn’t quite come together in the in these pictures. But it fit the actress perfectly. I was also very happy about how the neckline turned out, with the narrow lace creating a slight ruffle. And as you can see, the zip-cord boning did it’s job beautifully! The bodice front is smooth and straight. I also loved the sleeve ruffles. So simple to make, and yet so pretty! It was such a blessing that the lace came with that nice row of eyelets along the top. A perfect fit for the elastic cording! One of my favorite things about this costume is how all the different patterns and shades of blue and white give it so much depth and texture. Especially since it cost a total of maybe $10 (counting the shoe buckles, ribbon, and thread, which I actually didn’t have to purchase). It turned out even more unique and detailed than I had imagined and made me SO excited to move on to the next costume and see what else I could create! Speaking of the next costume…I’m trying to decide which I should post about next. Lumiere? Cogsworth? Gaston? So many to choose from. Do you have a favorite character/costume you want to see? Let me know in the comments!